This is a study of a kitchen remodel with the goals to improve function, allow more natural light in the space, and create an area where entertaining would be comfortable. 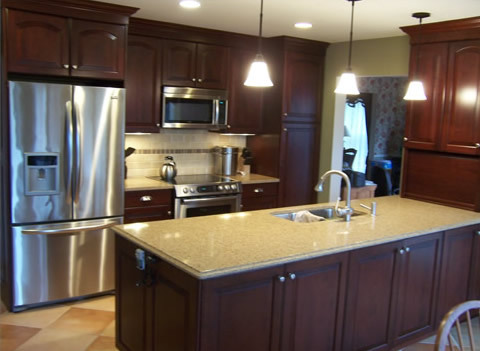 The kitchen is the focal point of a home. From mealtime to party time, the kitchen is where we all like to hang out. 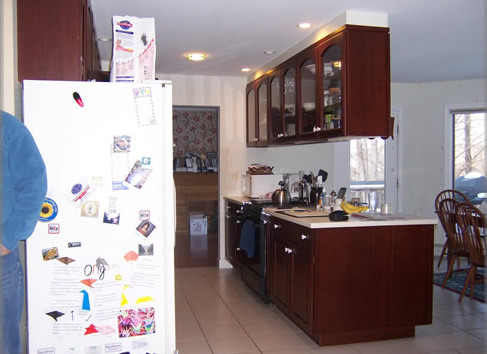 This kitchen suffered from misuse of space, with cabinetry that was not functional as storage and resulted in a cluttered, uncomfortable space. 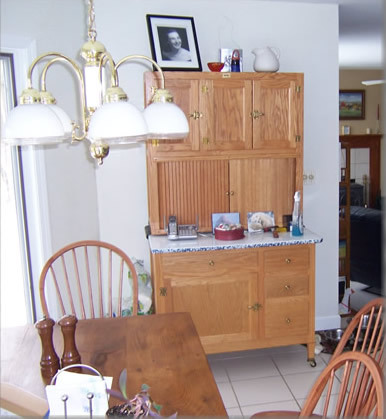 Before: Ceiling-mounted cabinets above the peninsula crated an enclosed space. The galley-type kitchen had ceiling-mounted cabinets above the peninsula, which made the kitchen feel cramped and cut off from the dining area. The kitchen did not function well for the family; it was even more challenging when they invited a few guests. The ceiling-mounted cabinets also blocked the view to the big bay window, which blocked natural light and made the kitchen dark. There was not enough storage, making the counters cluttered with appliances and utensils. The owner wanted to swap the range and sink location to take advantage of the improved lighting and space of the peninsula. After the space now has an open feel. 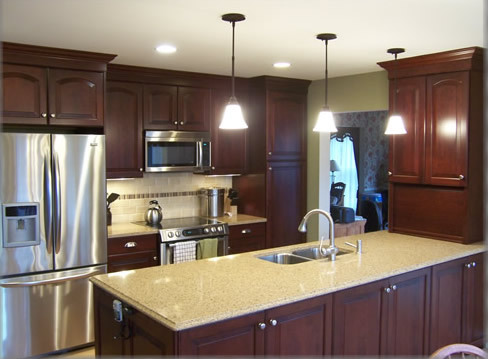 Most of the cabinetry was reused, which saved some money to put into better lighting and fixtures. 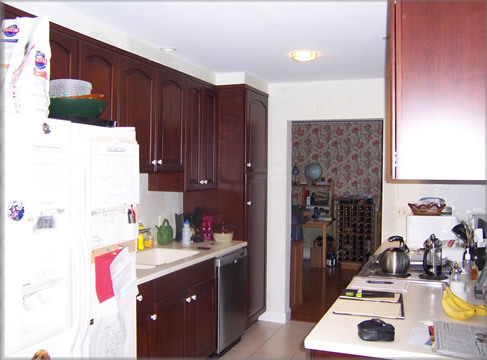 The doors and drawer fronts, along with the knobs, were replaced to match the new cabinetry for an updated look, and soft close hinges and drawer slides were installed to improve function. 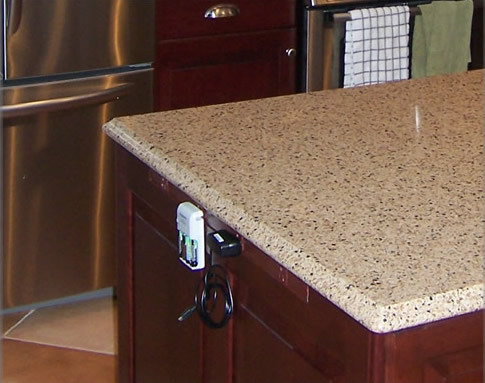 The new cabinetry added much-needed storage space, which allowed for a cleaner look and for the beautiful new quartz tops to be seen. The Pantry was replace and expanded. The Hoosier cabinet was replaced by a pantry that matched the new cabinetry but also maintained the look of freestanding furniture by adding feet to the base. The new pantry added enough storage so that the owners could have their counters back and eliminate the cluttered look, while seeing their spectacular new quartz. 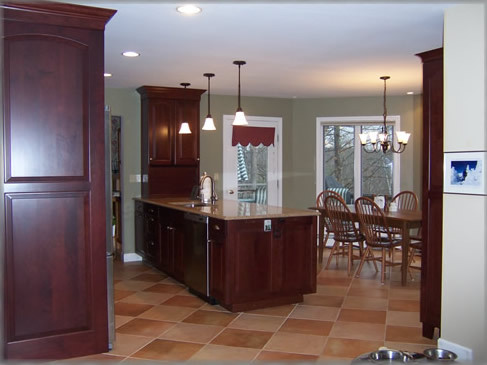 The crown molding ties it in with other new cabinetry for a cohesive look. 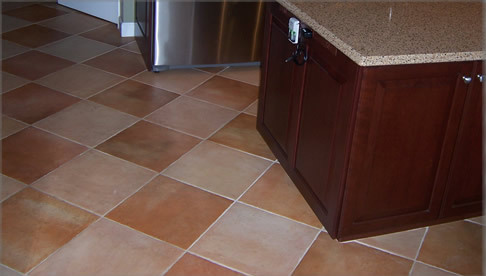 The light-colored tile was replaced by larger 16”x16” tile of two different colors. The tile was outdated and the grout was stained, and they were cracked because of improper installation and underlayment materials. 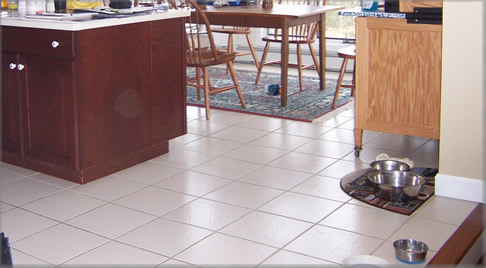 Today’s grouts are more stain-resistant and the tile’s low-maintenance and easy-to-clean characteristics fit the owner’s active lifestyle. Modernized electrical, and new appliace placement improve function. Four outlets in the appliance garage and the outlet strip at the end of the peninsula give ample power supply without visible outlets, which would detract from the beauty of the new space. 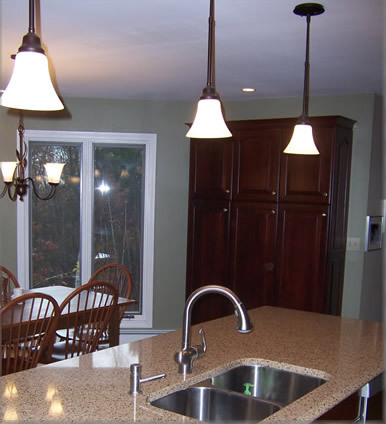 The microwave is now above the range, which frees up counter space and serves as a range hood with lighting and a fan. The new stainless steel appliances make for a very clean look.